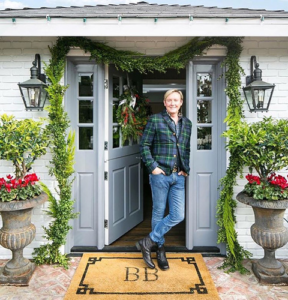 Five tips for entertaining outdoors with celebrated designer Barclay Butera. Bradburn Home, Eastern Accents, Kravet, Leftbank Art, Lexington Home Brands, Nourison. These are just some of the iconic brands that have been featured on the pages of Design NJ — with products designed by lifestyle expert, author and furnishings fashionista Barclay Butera. Most recently the renowned designer produced a line with a long-awaited outdoor furniture collection with Castelle featuring his signature white and navy blue color story. 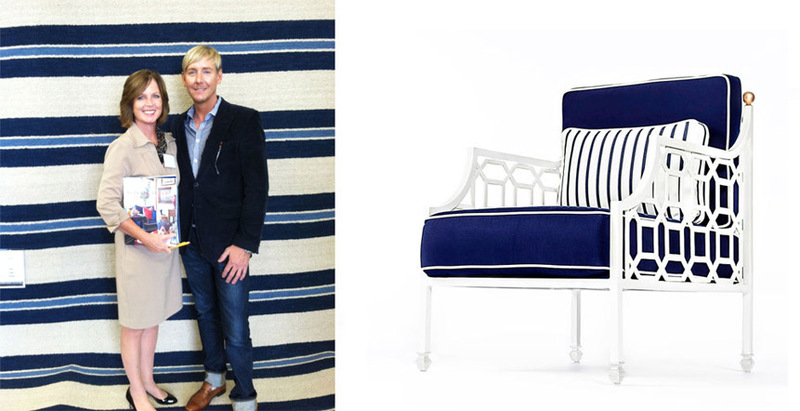 Left: With Barclay Butera celebrating the launch of his book Barclay Butera Living on the Coast with his classic Nourison stripe rug as a backdrop. Right: Barclay Butera Cushioned Lounge Chair from Castelle. 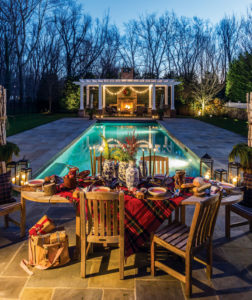 In the spirit of the holiday season, Butera says any outdoor space — even here on the often cold and frosty East Coast — need not be overlooked if you want to extend the party outdoors. What could be better than snuggling up by an outdoor fire under a warm blanket with a glass of red wine or hot toddy? Yes, the weather outside can be frightful. But it can also be balmy. Remember last year’s above average temps? In addition to comfortable seating, Butera shares his five make-or-break tips for entertaining outdoors. 1. Light up the night: Lighting is so important and adds an air of festive sophistication. 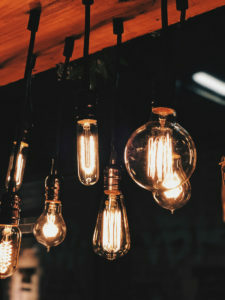 In addition to hurricanes with real candles, I prefer to string globe lights from the trees, and you can almost create a border around your entertaining area. When the sun goes down it’s magical, and when the guests arrive they know to follow the lights. 2. Music is everything: My tastes tend toward swinging classics from Frank Sinatra, Dean Martin and Steve Tyrell. Save the reflective religious ballads for another time; parties call for upbeat cheeky tunes that are a must. These guys know how to put your guests in the mood for a good cocktail. 3. 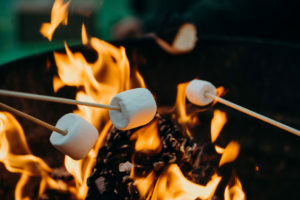 Get the fire started: When guests gather around a fire it’s so intimate. And I love the photo opps; nothing is quite as flattering as firelight! 4. Keep it toasty: I use plenty of pillows and throws on my outdoor furniture during the holidays. With all the great outdoor fabrics available, the sky’s the limit. And toasty fleece throws in holiday colors are great. They are lightweight, really warm, relatively inexpensive, and machine washable. Guests love to hunker down with a drink and tapas under a blanket. 5. Make it merry: I happen to love cranberry cider in a copper mug garnished with orange slices and cinnamon sticks. It’s festive and packs a punch. 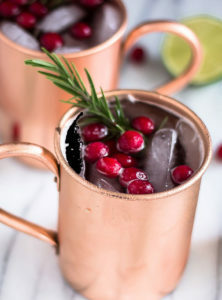 For something over ice, vodka tonics with a splash of cranberry garnished with mint are refreshing and the colors work. And of course, plenty of hearty red wine. I love Caymus Cabernet. If it’s a cocktail party, I keep the food simple with one-bite options. To be honest, I let my caterer do the work!